Today Esme and I went up the roof to have some coffee and enjoy the sun. I was curious if the stack of stones had already a new occupant. So I removed the stones. Under the stones there where a few pieces of old wood. When I lifted the last piece a scorpion started to run away... A female this time? Esme went down to get a plastic container. When she went back I was able to push the scorpion with a piece of paper in the container, and put the lid on the container. I was convinced we found a female. I remembered from a site I found using Google that with some species it's extremely hard to tell but the characteristics it describes and moreover the pictures match the description of my latest find. I am now also sure that Tina the scorpion was not female, but male. So including today's catch I have found 3 males and one female so far. Moreover, it seems the roof, or more specific, the stack of stones is an excellent hiding place for scorpions. The previous scorpion one I found 22 days ago. Since I already had seen that scorpions are cannibalistic (remember poor Georgio) I decided to buy another terrarium. So we went to the market at the end of the day to get us another terrarium. Since I wanted it to resemble more the roof I bought a nice piece of rock at the same shop. Since we didn't like the color of the gravel they sold, we went to a nearby petshop. I bought a small bag with white gravel and a small bag with white sand. 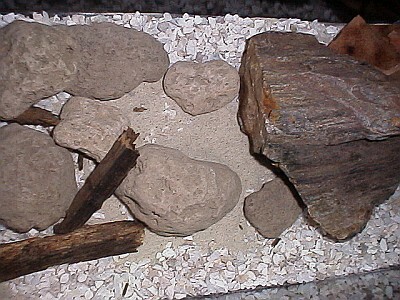 When we went back to the market to pick up the terrarium and rock, I bough at a different stand a few pieces of pumice. Back home I went back up the roof and picked up some pieces of wood to add to the terrarium. I tried to make a picture of the underside of the scorpion. Since the plastic container was not very clear and there was little light the picture turned out to be quite unclear. The pectines (white) are visible however. I also noticed the light brown round dots on the underside and wondered if this is something that can assist in classifying this animal. 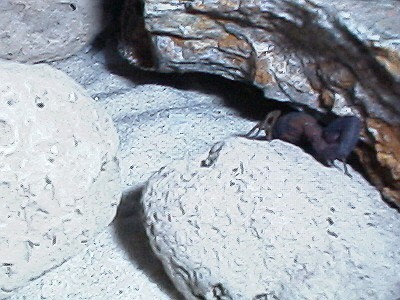 I put the scorpion in her new home, and it hid herself under the big piece of rock. 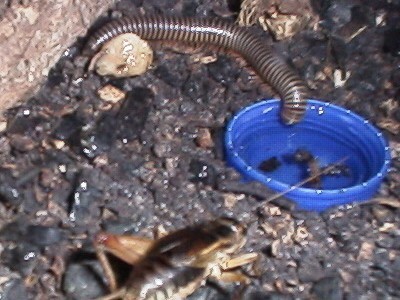 After I took the picture I noticed that the millipede was drinking in the other terrarium. I found the millipede earlier before the scorpion it shares the terrarium with, but had never actually seen it out of hiding, let alone drinking. 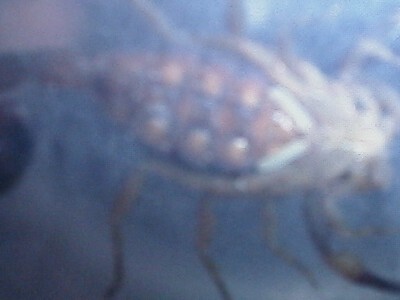 Also, the scorpion still hadn't eaten the cricket I caught 3 days earlier. So I decided to put the cricket in the terrarium with the new scorpion. In the evening the scorpion was walking around in her new place. It bumped a few times into the cricket but didn't attack it. The cricket even walked a few times over the scorpion. 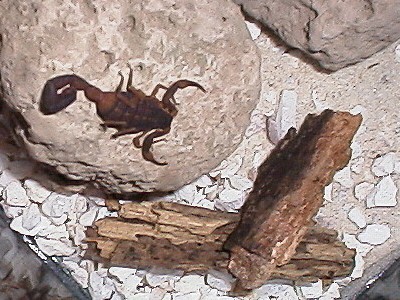 In the night I went down to have another look at the scorpion and saw her chewing on the cricket.